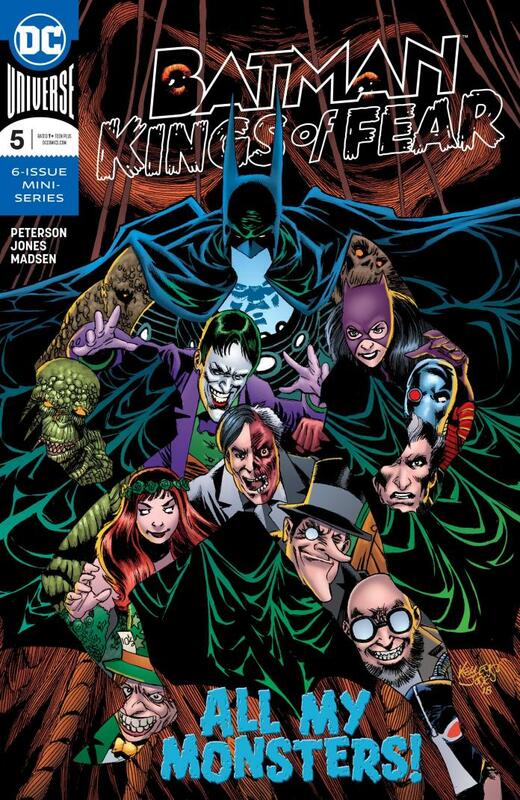 While the art by Kelley Jones continues to be amazing and wonderful, the writing of Scott Peterson gets to shine this time, as The Scarecrow takes his psychoanalysis of Batman in a new direction. Not unlike the film “It’s A Wonderful Life,” Scarecrow shows Batman, or to be more accurate, allows Batman’s inner visions brought forth by Scarecrow’s drugs to show him what Gotham City would be like if he had never taken up the cowl and cape and begun fighting crime. If, instead, he had put his energy and fortune into other kinds of good deeds and improvements in the lives of Gotham’s citizens. This is a clever premise, as we see a much brighter and happier Gotham, and also see where all of Batman’s arch-foes might have ended up without him to oppose them. Is this really something that Batman knows in his heart but is unable to acknowledge? I suppose we’ll find out in the thrilling final issue of this fun series! This entry was posted in Comics, Reviews on March 21, 2019 by Todd.